The Government today announced a target of 90 per cent of New Zealand’s lakes and rivers meeting swimmable water quality standards by 2040, and new policy, regulations, information maps and funding to help achieve its new goal. The 90 per cent goal by 2040 is estimated to cost the Government, farmers and councils $2 billion over the next 23 years. 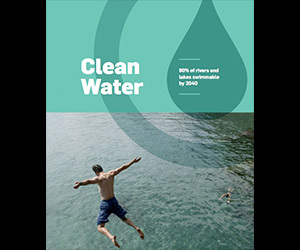 The government’s plan includes five key components, including a target of 90% of NZ rivers and lakes to be ‘swimmable’ by 2040; new maps and information on current water quality for swimming; changes to the national policy statement for Freshwater Management; criteria for the allocation of its $100million Freshwater Improvement Fund; and details of new national stock exclusion regulations. The government says its plan is backed up by national regulations requiring stock to be fenced out of waterways, new national policy requirements on regional councils to strengthen their plan rules on issues such as sewage discharges and planting riparian margins, a new Freshwater Improvement Fund and new maps that clearly identify where improvements are needed. However, observers such as Freshwater ecologist Mike Joy, have voiced their concerns that the new rules lower the standard of freshwater quality. Under the previous standards, a waterway was considered to considered ‘swimmable’ (excellent water quality) if the E coli level was less than 260 per 100ml of water. Under the new standard, water quality is considered excellent if it is below 540 per 100ml more than five percent of the time.